2003-05-27 Assigned to KIMBERLY-CLARK WORLDWIDE, INC. reassignment KIMBERLY-CLARK WORLDWIDE, INC. ASSIGNMENT OF ASSIGNORS INTEREST (SEE DOCUMENT FOR DETAILS). Assignors: SOERENS, DAVE, SHANNON, TOM G.
Base sheets are disclosed having a reduced coefficient of friction in the wet state. In accordance with the present invention, the base sheets can be treated with a high molecular weight polyethylene oxide, a derivatized polyethylene oxide or an acrylate copolymer containing polyethylene moieties. The base sheet can be single ply or multi-ply. The base sheet can be a tissue product, such as a facial tissue, a bath tissue, or a paper towel. Alternatively, the base sheet can be a pre-moistened wipe. FIG. 2 is a perspective view of another alternative embodiment of a process for producing paper webs that may be used in the present invention. 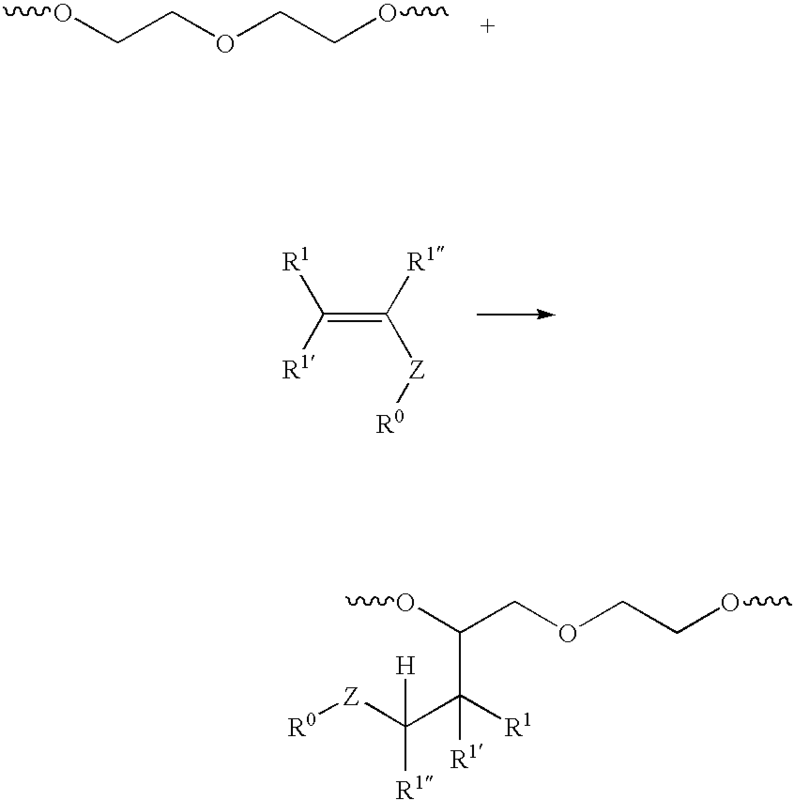 wherein R 1 and R2 are hydrogen or organofunctional groups. R1 and R2 can be the same or different. where R 1, R1′, R1″ are independently H or a C1-4 alkyl, Z is any bridging radical whose purpose is to incorporate the R0 moiety into the ethylenically unsaturated monomer, and R0 is any group capable of forming covalent and/or hydrogen bonds with cellulose or with the polymer itself. Examples of suitable Z groups include but are not limited to —O—, —S—, —OOC—, —COO—, —HNOC—, —CONH. Suitable R0 functional groups include amine, amide, carboxyl, hydroxyl, aldehyde, epoxy, silanol, and azetidinium groups. The materials may incorporate a second ethylenically unsaturated monomer whose purpose is to provide a charge or basis for charge development within the polymer. The charge is preferably cationic but may be anionic or amphoteric. Incorporation of such charge now makes the material substantive to cellulose in a wet end application. wherein R 1, R2 and R3 are the same or different alkyl groups, each independently having 1 to 6 carbon atoms. Q 1 is a monomer unit containing a functionality capable of hydrogen or covalently bonding with cellulose or any other polar or non-polar monomer not containing a pendant polyalkylene oxide functionality. Q 3 is a monomer unit or mixture of monomer units containing pendant polyalkylene oxide functionality wherein said pendant polyalkylene oxide functionality has a degree of polymerization greater than about 2. The ratio of c to (a+b+c) may vary such that the weight ratio of Q 3 to [Q1+Q2+Q3] is from about 5 to 100%, more specifically from about 10 to 100% and most specifically from about 20 to 100%. In a specific embodiment the charge functionality Q 2 is cationic. Examples of suitable monomers for incorporating the charge functionality include but is not limited to [2-(methacryloyloxy)ethyl] trimethylammonium methosulfate (METAMS); dimethyldiallyl ammonium chloride (DMDAAC); 3-acryloamido-3-methyl butyl trimethyl ammonium chloride (AMBTAC); trimethylamino methacrylate; vinyl benzyl trimethyl ammonium chloride (VBTAC); 2-[(acryloyloxy)ethyl] trimethylammonium chloride; [2-(methacryloyloxy)ethyl] trimethylammonium chloride. wherein R 1′, R1″, R2, R2′, R2″, R3, R3′, R3″ are independently H, or C1-4 alkyl. Z1, Z2, Z3 are any bridging radicals, the same or different whose purpose is to incorporate the Ri moieties into the ethylenically unsaturated polymer backbone. Suitable radicals include but are not limited to —CONH—, NHCO—, —O—, —S—, —CH2—, -aryl-, —COO—, —OOC— and the like. R4 can be any functional group incorporated as part of an ethylenically unsaturated monomer, R5 is any cationically charged species, and R6 is a polyoxyethylene or polyoxyalkylene derivative of the formula —(CHR7CHR8O)s—(CH2CH2O)t—(CHR9CHR10O)v—R11 wherein R7, R8, R9, R10 are independently C1-4 alkyl groups; s, t, v are integers such that t>0 and s+t+v>3. R11 can be any suitable terminating radical including H, alkyl, substituted alkyl, aryl and substituted aryl. Values of p & q are ≧0 while the value or r>0. The percent of R6 in the polymer should range from 5 to 100 weight percent, particularly from 10 to 100 weight percent and still more particularly from about 20 to 100 weight percent of the total polymer. In theory, any -[Q]j- elements such [Q]j elements representing any ethylenically unsaturated monomer unit can be built into the polymer without interfering with the perceived tactile properties as long as the R6 units are present in the polymer at the stated level. Wherein X − is any suitable anion including but not limited to chloride, bromide, fluoride, iodide, methylsulfate, ethylsulfate and the like. As shown in FIG. 1, the web-forming system includes a headbox  10 for receiving an aqueous suspension of fibers. Headbox 10 spreads the aqueous suspension of fibers onto a forming fabric 26 that is supported and driven by a plurality of guide rolls 34. A vacuum box 36 is disposed beneath forming fabric 26 and is adapted to remove water from the fiber furnish to assist in forming a web. From forming fabric  26, a formed web 38 is transferred to a second fabric 40, which may be either a wire or a felt. Fabric 40 is supported for movement around a continuous path by a plurality of guide rolls 42. Also included is a pick up roll 44 designed to facilitate transfer of web 38 from fabric 26 to fabric 40. The speed at which fabric 40 can be driven is approximately the same speed at which fabric 26 is driven so that movement of web 38 through the system is consistent. Alternatively, the two fabrics can be run at different speeds, such as in a rush transfer process, in order to increase the bulk of the webs or for some other purpose. From fabric  40, web 38, in this embodiment, is pressed onto the surface of a rotatable heated dryer drum 46, such as a Yankee dryer, by a press roll 43. Web 38 is lightly pressed into engagement with the surface of dryer drum 46 to which it adheres, due to its moisture content and its preference for the smoother of the two surfaces. As web 38 is carried through a portion of the rotational path of the dryer surface, heat is imparted to the web causing most of the moisture contained within the web to be evaporated. Web  38 is then removed from dryer drum 46 by a creping blade 47. Creping web 38 as it is formed reduces internal bonding within the web and increases softness. In an alternative embodiment, instead of wet pressing the base web  38 onto a dryer drum and creping the web, the web can be through-air dried. A through-air dryer accomplishes the removal of moisture from the base web by passing air through the web without applying any mechanical pressure. For example, referring to FIG. 2, an alternative embodiment for forming a base web for use in the process of the present invention containing a through-air dryer is illustrated. As shown, a dilute aqueous suspension of fibers is supplied by a headbox  10 and deposited via a sluice 11 in uniform dispersion onto a forming fabric 26 in order to form a base web 38. Once deposited onto the forming fabric  26, water is removed from the web 38 by combinations of gravity, centrifugal force and vacuum suction depending upon the forming configuration. As shown in this embodiment, and similar to FIG. 1, a vacuum box 36 can be disposed beneath the forming fabric 26 for removing water and facilitating formation of the web 38. From the forming fabric  26, the base web 38 is then transferred to a second fabric 40. The second fabric 40 carries the web through a through-air drying apparatus 50. The through-air dryer 50 dries the base web 38 without applying a compressive force in order to maximize bulk. For example, as shown in FIG. 2, the through-air drying apparatus 50 includes an outer rotatable cylinder 52 with perforations 54 in combination with an outer hood 56. Specifically, the fabric 40 carries the web 38 over the upper portion of the through-air drying apparatus outer cylinder 52. Heated air is drawn through perforations 54 which contacts the web 38 and removes moisture. In one embodiment, the temperature of the heated air forced through the perforations 54 can be from about 170° F. to about 500° F.
In one embodiment, the second fabric  40 can be moving at a slower speed than the forming fabric 26 in a process known as rush transfer. The base web is transferred from the forming fabric to the dryer fabric (optionally a transfer fabric can be interposed between the forming fabric and the dryer fabric) traveling at a slower speed than the forming fabric in order to impart increased stretch into the web. Transfer can be carried out with the assistance of a vacuum shoe and a fixed gap or space between the forming fabric and the dryer fabric or a kiss transfer to avoid compression of the wet web. The second fabric 40 can be traveling at a speed, for instance, that is from about 5 percent to about 60 percent slower than the forming fabric. a wet anti-friction composition applied to at least one side of the base sheet, the wet anti-friction composition being applied in an amount sufficient for the treated side of the base sheet to have a wet static coefficient of friction that is no more than about 10% greater then the dry static coefficient of friction of the treated side. 2. A tissue product as defined in claim 1, wherein the wet anti-friction composition comprises a polyethylene oxide having a molecular weight of at least about 20,000. 3. A tissue product as defined in claim 2, wherein the polyethylene oxide has a molecular weight of at least about 50,000. 4. A tissue product as defined in claim 2, wherein the polyethylene oxide has a molecular weight of from about 200,000 to about 2,000,000. 5. A tissue product as defined in claim 1, wherein the wet anti-friction composition comprises a derivatized polyethylene oxide, the polyethylene oxide having a molecular weight of greater than about 20,000. R0 is a moiety containing a functional group selected from the group H, amine, amide, carboxyl, hydroxyl, aldehyde, epoxy, silanol and azetidinium groups, and mixtures thereof. 8. A tissue product as defined in claim 5, wherein the derivatized polyethylene oxide has silanol functional groups. 9. A tissue product as defined in claim 5, wherein the derivatized polyethylene oxide forms covalent or ionic bonds with paper fibers. 10. A tissue product as defined in claim 5, wherein the derivatized polyethylene oxide contains from about 0.5 percent to about 25 percent by weight of pendant functional groups. 11. A tissue product as defined in claim 1, wherein the wet anti-friction composition comprises a polymer or copolymer derived from ethylenically unsaturated monomers wherein at least one monomer comprises a pendant polyalkylene oxide moiety. the ratio of c to (a+b+c) is chosen such that the weight ratio of Q3 to [Q1+Q2+Q3] is from about 5 to 100%. 13. A tissue product as defined in claim 12 wherein the ratio of c to (a+b+c) is chosen such that the weight ratio of Q3 to [Q1+Q2+Q3] is from about 20 to 100%. 14. A tissue product as defined in claim 12 wherein polymer or copolymer has a weight average molecular weight of greater than about 20,000. 15. A tissue product as defined in claim 12 wherein b>0 and Q2 is derived from a monomer unit containing a cationic charge functionality. 16. 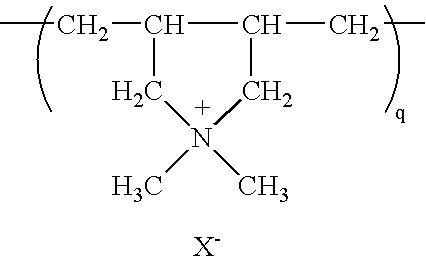 A tissue product as defined in claim 15 wherein the cationic charge functionality is incorporated via a diallydimethylammonium cationic monomer. R6 is a polyoxyethylene or polyoxyalkylene derivative of the formula —(CHR7CHR8O)s—(CH2CH2O)t—(CHR9CHR10O)v—R11 wherein R7, R8, R9, R10 are independently C1-4 alkyl groups; s, t, v are integers such that t>0 and s+t+v>3; R11 is a terminating radical including H, alkyl, substituted alkyl, aryl and substituted aryl; and values of p & q are ≧0 while the value of r>0. 19. A tissue product as defined in claim 11, wherein the acrylic copolymer comprises a poly(ethylene glycol) alkyl ether methacrylate. 20. A tissue product as defined in claim 1, wherein the base sheet has a wet static coefficient of friction that is no more than 3 percent greater than the dry static coefficient of friction of the treated side. 21. A tissue product as defined in claim 1, wherein the base sheet has a wet static coefficient of friction that is no greater than the dry static coefficient of friction of the treated side. 22. A tissue product as defined in claim 1, wherein the wet anti-friction composition is applied to the base sheet in an amount from about 0.03 percent to about 3 percent by weight of fibers contained in the base sheet. 23. A tissue product as defined in claim 1, wherein the wet anti-friction composition has been topically applied to the base sheet. 24. A tissue product as defined in claim 1, wherein the wet anti-friction composition is incorporated into the base sheet during its formation. 25. A tissue product as defined in claim 1, wherein the tissue product has a wet out time of about 20 seconds or less. a wet anti-friction composition applied to at least one side of the base sheet, the wet anti-friction composition being applied in an amount sufficient for the treated side of the base sheet to have a wet dynamic coefficient of friction that is no more than about 10% greater then the dry dynamic coefficient of friction of the treated side. 27. A tissue product as defined in claim 26, wherein the wet anti-friction composition comprises a polyethylene oxide having a molecular weight of at least about 20,000. 28. A tissue product as defined in claim 27, wherein the polyethylene oxide has a molecular weight of at least about 50,000. 29. A tissue product as defined in claim 27, wherein the polyethylene oxide has a molecular weight of from about 200,000 to about 2,000,000. 30. A tissue product as defined in claim 26, wherein the wet anti-friction composition comprises a derivatized polyethylene oxide, the polyethylene oxide having a molecular weight of greater than about 20,000. 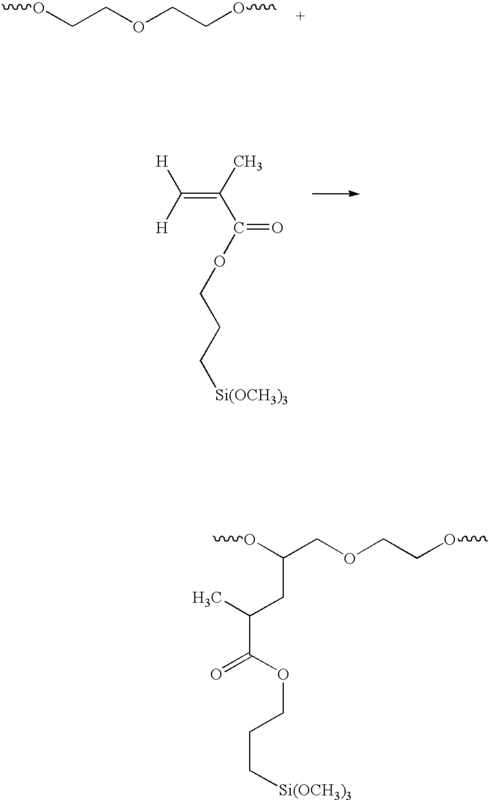 R0 is a moiety containing a functional group selected from the group H, amine, amide, carboxyl, hydroxyl, aldehyde, epoxy, silanol, azetidinium groups, and mixtures thereof. 33. 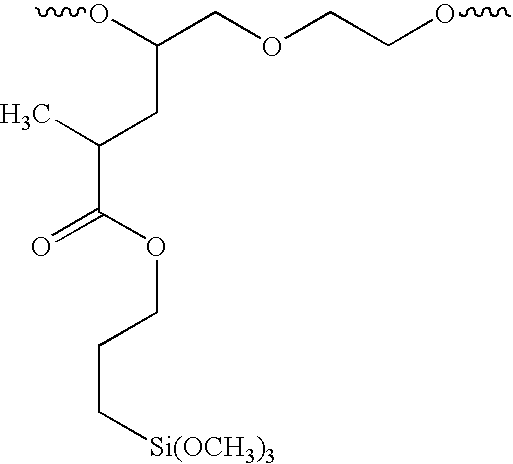 A tissue product as defined in claim 30, wherein the derivatized polyethylene oxide has silanol functional groups. 34. A tissue product as defined in claim 30, wherein the derivatized polyethylene oxide forms covalent or ionic bonds with paper fibers. 35. A tissue product as defined in claim 30, wherein the derivatized polyethylene oxide contains from about 0.5 percent to about 25 percent by weight of pendant functional groups. 36. A tissue product as defined in claim 26, wherein the wet anti-friction composition comprises a polymer or copolymer derived from ethylenically unsaturated monomers wherein at least one monomer comprises a pendant polyalkylene oxide moiety. 38. A tissue product as defined in claim 37 wherein the ratio of c to (a+b+c) is chosen such that the weight ratio of Q3 to [Q1+Q2+Q3] is from about 20 to 100%. 39. A tissue product as defined in claim 37 wherein polymer or copolymer has a weight average molecular weight of greater than about 20,000. 40. A tissue product as defined in claim 37 wherein b>0 and Q2 is derived from a monomer unit containing a cationic charge functionality. 41. A tissue product as defined in claim 40 wherein the cationic charge functionality is incorporated via a diallydimethylammonium cationic monomer. 44. A tissue product as defined in claim 36, wherein the acrylic copolymer comprises a poly(ethylene glycol) alkyl ether methacrylate. 45. A tissue product as defined in claim 26, wherein the base sheet has a wet dynamic coefficient of friction that is no more than 3 percent greater than the dry dynamic coefficient of friction of the treated side. 46. A tissue product as defined in claim 26, wherein the base sheet has a wet dynamic coefficient of friction that is no greater than the dry dynamic coefficient of friction of the treated side. 47. A tissue product as defined in claim 26, wherein the wet anti-friction composition is applied to the base sheet in an amount from about 0.03 percent to about 3 percent by weight of fibers contained in the base sheet. 48. A tissue product as defined in claim 26, wherein the wet anti-friction composition has been topically applied to the base sheet. 49. A tissue product as defined in claim 26, wherein the wet anti-friction composition is incorporated into the base sheet during its formation. 50. A tissue product as defined in claim 26, wherein the tissue product has a wet out time of about 20 seconds or less. a wet anti-friction composition applied to at least one side of the base sheet, the wet anti-friction composition being applied to the base sheet in an amount sufficient for the treated side of the base sheet to have a lower coefficient of friction in the wet state, the anti-friction composition comprising a polyethylene oxide having a molecular weight of greater than about 20,000, a derivatized polyethylene oxide in which the polyethylene oxide has a molecular weight of greater than about 20,000, or an acrylate copolymer containing polyethylene oxide moieties. 52. A treated wiping product as defined in claim 51, wherein the wet anti-friction composition comprises polyethylene oxide having a molecular weight of from about 400,00 to about 2,000,000. 55. A treated wiping product as defined in claim 53, wherein the derivatized polyethylene oxide forms covalent or ionic bonds with paper fibers. 56. A treated wiping product as defined in claim 53, wherein the derivatized polyethylene oxide contains from about 0.5 percent to about 25 percent by weight of pendant functional groups. 57. A treated wiping product as defined in claim 51, wherein the wet anti-friction composition comprises a polymer or copolymer derived from ethylenically unsaturated monomers wherein at least one monomer comprises a pendant polyalkylene oxide moiety..
59. A treated wiping product as defined in claim 58 wherein the ratio of c to (a+b+c) is chosen such that the weight ratio of Q3 to [Q1+Q2+Q3] is from about 20 to 100%. 60. A treated wiping product as defined in claim 58 wherein polymer or copolymer has a weight average molecular weight of greater than about 20,000. 61. A treated wiping product as defined in claim 58 wherein b>0 and Q2 is derived from a monomer unit containing a cationic charge functionality. 62. A treated wiping product as defined in claim 61 wherein the cationic charge functionality is incorporated via a diallydimethylammonium cationic monomer. 65. A treated wiping product as defined in claim 51, wherein the wet anti-friction composition is applied to the base sheet in a total amount of from about 0.03 percent to about 3 percent by weight. 66. A treated wiping product as defined in claim 53, wherein R0 comprises from about one-half percent to about 10 percent by weight of the derivatized polyethylene oxide. 67. A treated wiping product as defined in claim 51, wherein the wiping product comprises a facial tissue, a bath tissue, or a paper towel. 68. A treated wiping product as defined in claim 51, wherein the base sheet comprises more than one ply. 69. A treated wiping product as defined in claim 51, wherein the wiping product comprises a pre-moistened wipe. 70. A treated wiping product as defined in claim 67, wherein the treated side of the base sheet has a wet static coefficient of friction that is no more than about 10 percent greater than the dry static coefficient of friction of the treated side. 71. A treated wiping product as defined in claim 67, wherein the treated side of the base sheet has a wet dynamic coefficient of friction that is no more than about 10 percent greater than the dry dynamic coefficient of friction of the treated side. incorporating into the base sheet a wet anti-friction composition, the wet anti-friction composition being incorporated into the base sheet in an amount sufficient such that at least one side of the base sheet has a lower wet static coefficient of friction, the wet anti-friction composition comprising a polyethylene oxide having a molecular weight of at least about 20,000, a derivatized polyethylene oxide containing a polyethylene oxide having a molecular weight of at least about 20,000, or an acrylate copolymer containing polyethylene oxide moieties. 73. A process as defined in claim 72, wherein the wet anti-friction composition comprises a polyethylene oxide having a molecular weight of from about 200,000 to about 2,000,000. 76. 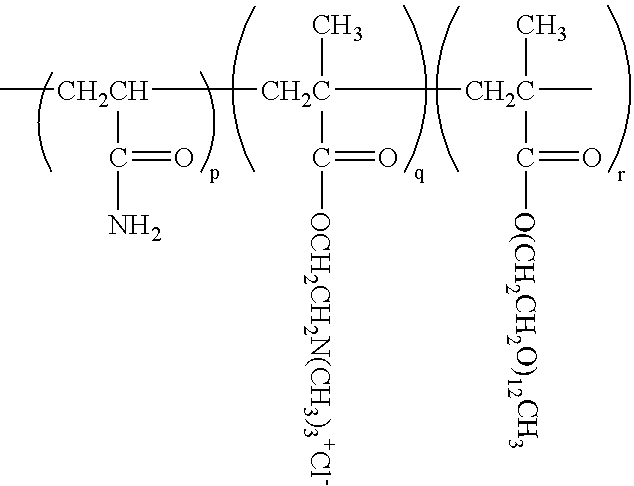 A process as defined in claim 74, wherein the derivatized polyethylene oxide forms covalent or ionic bonds with paper fibers. 77. A process as defined in claim 74, wherein the derivatized polyethylene oxide contains from about 0.5 percent to about 25 percent by weight of pendant functional groups. 78. A process as defined in claim 72, wherein the wet anti-friction composition comprises a polymer or copolymer derived from ethylenically unsaturated monomers wherein at least one monomer comprises a pendant polyalkylene oxide moiety. 80. A process as defined in claim 79 wherein the ratio of c to (a+b+c) is chosen such that the weight ratio of Q3 to [Q1+Q2+Q3] is from about 20 to 100%. 81. A process as defined in claim 79 wherein polymer or copolymer has a weight average molecular weight of greater than about 20,000. 82. A process as defined in claim 79 wherein b>0 and Q2 is derived from a monomer unit containing a cationic charge functionality. 83. A process as defined in claim 82 wherein the cationic charge functionality is incorporated via a diallydimethylammonium cationic monomer. R6 is a polyoxyethylene or polyoxyalkylene derivative of the formula —(CHR7CHR8O)s—(CH2CH2O)t—(CHR9CHR10O)v—R11 wherein R7, R8, R9, R10 are independently C1-4 alkyl groups; s, t, v are integers such that t>0 and s+t+v>3; R11 is a terminating radical including H, alkyl, substituted alkyl, aryl and substituted aryl; and values of p & q are >0 while the value of r>0. 86. A process as defined in claim 84, wherein the wet anti-friction composition is incorporated into the base sheet in an amount from about 0.03 percent to about 3 percent by weight of fibers contained in the base sheet. 87. A process as defined in claim 84, wherein the wiping product comprises a facial tissue, a bath tissue, or a paper towel. 88. A process as defined in claim 84, wherein the treated wiping product comprises a premoistened wipe. 89. A process as defined in claim 84, wherein the wet anti-friction composition is incorporated into the base sheet by being topically applied to one side of the sheet. 90. A process as defined in claim 89, wherein the wet anti-friction composition is applied topically to both sides of the base sheet. 91. A process as defined in claim 84, wherein the wet anti-friction composition is incorporated into the base sheet by being added to an aqueous suspension of fibers that is used to form the base sheet. MXPA05005887A MXPA05005887A (en) 2002-12-20 2003-11-03 Wiping products having a low coefficient of friction in the wet state and process for producing same. DE68914338D1 (en) 1988-06-14 1994-05-11 Procter & Gamble Non-cationic, surfactant-containing, soft tissue paper.